Alpe du Grand Serre is a perfect place for those who are tired from the fuss of the large resorts and wishing for a bit more intimacy on the slopes. 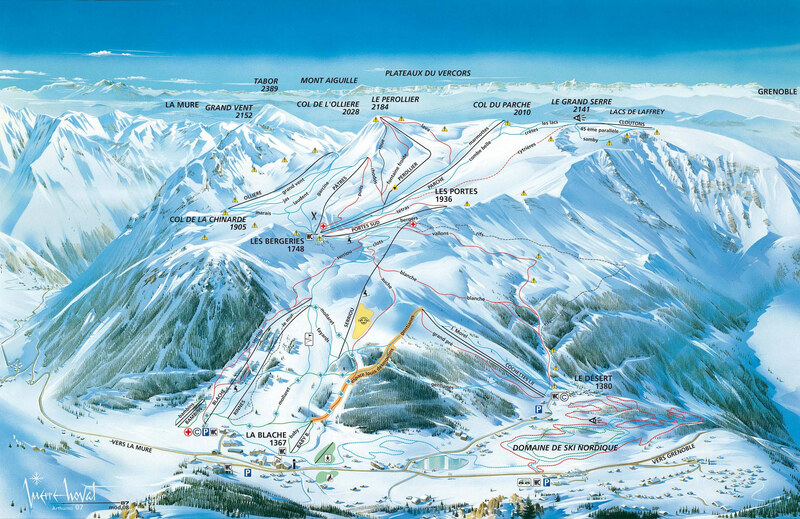 Alpe du Grand Serre ski resort offers different activities for everyone – pistes for beginners and experienced skiers, ski schools for kids, snow parks and a wide variety of restaurants and bars. Located at an elevation of 1368 m in the French Dauphine Alps near the commune of La Morte, the Alpe du Grand Serre ski resort sits at the summit of a mountain pass. Due to it’s smaller size, the village is more popular among locals and people from the neighbouring Grenoble, and it is an ideal place to enjoy the French countryside and everything it has to offer in a francophone atmosphere. If you’re travelling to Alpe du Grand Serre by train, make sure to choose the closest station - Gare de Grenoble, located 40 km away from the resort. The train services are operated by SNCF. From the train station, any transfers to your final destination can be arranged. Regardless of your itinerary when heading out to Alpe du Grand Serre, our dynamic pricing system will keep your costs as low as possible. By taking into account the specifics each individual transfer to any destination, we are able to offer our costumers the best possible deals at all times. Choosing Alps2Alps means securing comfortable and reliable transfers for you and your group to your chosen destination for the lowest possible price. All of the aforementioned criteria will only ever result in our ski transfer base-rate. We never over-inflate our prices at any time or for any reason. We also offer considerable discounts for off-peak, off-season and midweek transfers to Alpe du Grand Serre. If scouting for the best possible deals, travelling outside peak season or midweek typically results in the biggest savings. Save up to 60% by choosing a midweek (Monday to Friday) transfer! Alpe du Grand Serre provides many activities for kids and families. One of the most popular is the Bout’choux kindergarten, which offers activities like sledging, igloo building, handicraft activities and much more. The kindergarten welcomes kids from 3 months to 6 years old. Starting at age the of 4, children can join the Club Piou Piou, a ski program designed uniquely for first-timers. In order to get the very best price, we recommend booking a transfer to Alpe du Grand Serre ahead of time. As soon as you have made a decision, simply give a call to our customer care team or fill out the online booking form. Every trip starts with a transfer. Choose the best one – choose Alps2Alps!